Raksha Bandhan is one of the famous and popular festivals of India. Raksha Bandhan means bond of protection. It is a celebration of the bond of affection between brothers and sisters. The relationship between siblings denotes invaluable friendship and loving bond and sometimes fights over trivial things. This festival makes this eternal bond more strong and deeper. Sister tie thread to her brother’s wrist and prays for his well being and happiness while brother gives a gift or shagun and takes a pledge to protect her. It’s occasion of family bonding and togetherness. This celebration breaks the monotony of daily life and brings the family together to celebrate the festival. 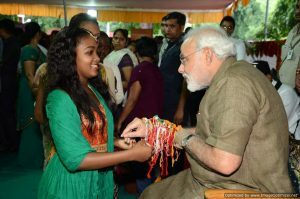 This year on 26th August, Raksha Bandhan or Rakhi will be celebrated all across the Indian subcontinent, Nepal, Mauritius and Hindu communities all over the world. Sikh and Jain communities also celebrate Raksha Bandhan. Full moon day of Shravan month is one of the auspicious days in a Hindu calendar. fisher communities of Maharashtra, Goa, and Kerela celebrate this day as Narali Poornima or Nariyal Poornima and they pray Sea God Varun to seek protection. In West Bengal, Jhulan Poornima is marked for worshiping Radha Krishna. 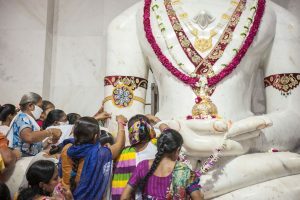 In central India, people celebrate Kajari Poornima. 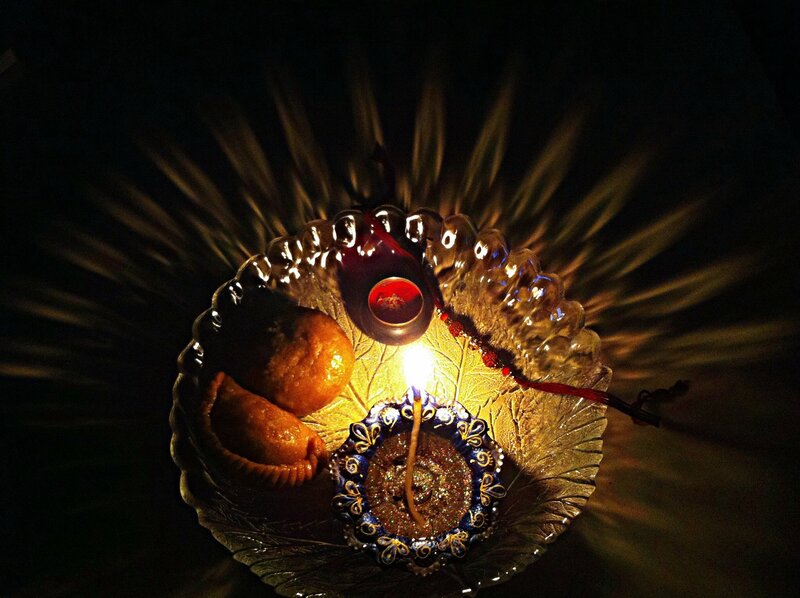 Gamha Poornima celebrates in the state of Odisha while Avani Avittam in South India. In Uttarakhand, brahmins observe Yojnopavit or Janeyu change ceremony. 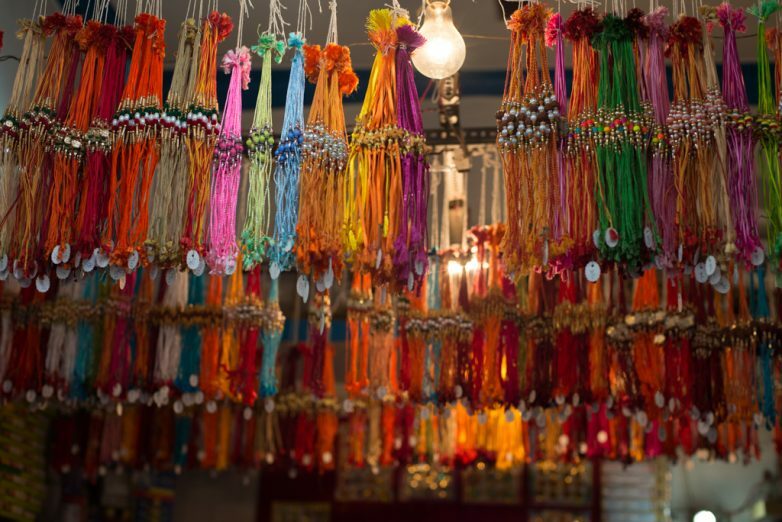 Mentions of Raksha Bandhan dates back to puranic times. Our scriptures have many references for this ritual of tying string for well-being and protection from evil. Punya Pradayak Parva and Paap Nashak Parv as mentioned in scriptures is another name of this festival, which means a festival which bestows the boon and destroys all sins. During the devasur Sangram (God and demons war), Demon Brutra was on the verge of winning but lost to Indira. Upset by the losing the war, Bruta consulted Asur Guru Shukracharya. Guru Shukracharya told him that Dev Guru Brihaspati advised Indra to tie a consecrated string on Shravan Poornima. Indrani, wife of Indra tied thread energized by the mantra to his wrist. As a result, Indra won the battle. Rakshasutra made him Invincible.this is the impact of rakshasutra which not only protect but also gives power, wealth and happiness. In Raj-suya yagya, Lord Krishna’s finger got hurt and started bleeding after slaying evil king Shishupala. 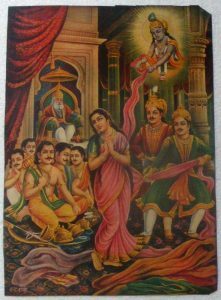 Seeing the blood, Draupadi tore a part of her sari and tied around Krishna’s wrist to stop blood flow. The kind act of Draupadi made Lord Krishna touched and indebted and he pledged to protect her in all circumstances whenever she needs. When Pandav lost her wife Draupadi in the gamble, Duryodhana ordered his brother Dussasana to disrobe her in court. Lord Krishna elongated Draupadi’s sari and thus saved her dignity. As mentioned in Mahabharat, Lord Krishna suggested Yudhishthira perform this sacred ritual to protect himself and army from the ill effects of war. Therefore, on Lord Krishna’s advice, Kunti tied rakhi to her grandson Abhimanyu and Draupadi tied Rakhi to Lord Krishna. Lord Vishnu left his abode Vaikuntha to guard his ardent devotee Mahabali’s Kingdom. This made Goddess Lakshmi very sad. So, She took refuge in Bali’s palace in disguise of Brahmin woman. On the day of Shravan Poornima, she tied rakhi to the wrist of Mahabali and revealed the truth and reason for coming to his place. Mahabali was moved to know the greatness of his Lord who himself came to protect him and his kingdom. As a result, He sacrificed everything he had for Lord Vishnu and Goddess Lakshmi. He requested Lord Vishnu to accompany Goddess Lakshmi in Vaikuntha. Baleva, the other name of the festival marks the great devoutness of demon king Mahabali for Lord Vishnu. Thus from this day onward, it is customary to invite sisters on Shravan Poornima for thread tying ceremony. In 326BC wife of Alexander Roxana tied the Rakhi to King Pauras and took a promise from him to not to harm his husband. Although King Pauras fought the battle but avoided a direct fight with Alexander so that he can serve his promise. Rani Karnavati of Chittor sent Rakhi to Mughal Emperor Humayun and asked to protect her kingdom from the invasion of Bahadur Shah. Unfortunately, Humayun came late and She along with other women of the kingdom immolated themselves to save the honor from the hands of invaders. From the history and origin of this festival, we can conclude that Raksha Bandhan not only holds significance for siblings but it is relevant in modern times as well. Rabindra Nath Tagore organized this festival to strengthen the communal bond between Hindus and Muslims during the colonial period. Therefore, Political parties celebrate this festival every year to promote harmonious relations between different society. Symbolically, this Hindu festival Raksha Bandhan is a festival of family, society, and harmony. On the core of this festival lies an ancient wisdom of inculcating peaceful coexistence and righteous behavior towards each other. Was amazed at the various perspectives you described here. Simply super information, written and narration. This should be passed to all younger generations expecially school children. Hatts off to you. Lovely article , keep it up. Kudos.